You may remember the item that appeared about 18 months ago about Matt Damon playing the part of former South African rugby captain François Pienaar in a film to be directed by Clint Eastwood. This will almost certainly be Hollywood's first attempt to base a mainstream film around rugby - its certainly the first time a major star like Damon has had to play the game. Quite how realistic the rugby scenes will be we can only guess at, though there are some hints in the trailer. What will be even more interesting to see is whether such a high profile film will have an effect on the number of people playing the game, especially in the USA and other "non-traditional" rugby countries. It is difficult to believe that it will do the game any harm. It seems that Invictus will be launched, presumably in the USA, in December - which means that it will probably appear over here in the Spring/Easter. This Sunday sees both girls teams travelling to Chesham for matches against Bucks Jesters. An unusual feature of these games is that we have morning kick-offs so will all players please make sure that they are at the Letchworth club by 9am. If you are travelling directly to Chesham, please make sure that Mike, Potsy or Wonky know what you are doing. The venue can be found in Chartridge Lane, Chesham HP5 2RG. Please be there by 10.10am at the latest. The Sky Sports Magazine (sent free to all subscribers) confirms that the second test between England and New Zealand will be shown - live - on Sky Sports 2 (and HD) on the 21st November, from 4.30pm. In fact the magazine has a big, and very prominent, page-and-a-bit feature on the game on page 5 (the men don't get a look in until page 32!). The article is based around an interview with England captain Catherine Spencer, and includes several "facts" about the game... one of which seems a shade dodgy (are there really "500 more female than male clubs in Scotland and Wales"?). If anyone wants to go to the game, entry will be free for the second test at Twickenham (well, after the men's international has been played - you won't get into see that game free as well!). The first test at Esher RFC on the 14th won't be on TV and there will be a small entry fee for that one (about £5 I think). The tour also includes a game between England A and New Zealand, also at Esher, in between the two tests. This will be the first time New Zealand have ever played in England - indeed the first time the Black Ferns have visited the UK since the first World Cup back in 1991 - so its really not to be missed. If you get any chance to get to see the world's top two teams battling it out next month - grab it! Teams train in all sorts of cold, muddy locations - the training pitch is not normally the one with the best facilities or resources (like, for instance, at Letchworth where grass is at a premium for most of the year!). But this is a brilliant photo, don't you think? Not only are the props in the picture doing some pretty impressive lifting, there's a good high catch from the second row, all in a perfect setting - the sun behind them as they stand on their Caribbean beach. You wonder if this was just chance, or whether it was staged... and if so how many attempts it took. And that is before you get to questions like how you lift someone wearing only a swimsuit! It also shows how wide and varied the rugby world can be. From beach rugby in the Caribbean to lumirugbya in Finland (left) to the mud of Hertfordshire (give it a few more weeks!). Further to earlier reports apparently Knights Templar's opponents earlier this week were Icknield School from Luton... and the score was 25-25 (as earlier reported, but mistakenly "corrected"). Apparently one try was... debated, shall we say... and some reporters incorrectly discounted it when reporting the score. But hey, who cares? Half the team were Legends, including all the try scorers, and maybe the rest can be recruited as well. Along with the opposition too, perhaps? So its all good news! News that five Legends (Jess, Sydney, Annie, Jodie and Lauren) played for Knights Templar this afternoon in an exciting 25-20 win against... err, well contacts are unclear as to exactly who they were playing... but reports do agree that Syd scored four of Knights five tries - Jodie getting the other. More information just as soon as anyone can provide it! Good news - the IRB have launched a website for the World Cup! Bad news - and in defiance of mathematical logic - its for the "other" World Cup in 2011, not the one that is in 2010. It seems the site is being launched to "celebrate" the fact that the men's competition is two years away, neatly ignoring that the women's event is only just over 10 months away and therefore (on that basis) might just be slightly overdue in having something? Certainly something better than the rather scrappy leavings from the 2006 event, which is all that is currently being offered - a site that does not even acknowledge that the 2010 competition will be taking place! Perhaps something really special is being planned which will be launched in a blaze of glory, maybe after the Asian qualifiers in a few weeks time - something at least comparable to the men's site? It shows how far we still have to go that the mere appearance of a positive article on women's rugby in a national newspaper should be a matter of note, but the article in today's Independent on Sunday is not only good to see, but also one of the most well researched articles I have seen for a long time. Its not perfect - it still relies on the wildly inaccurate RFU player number data (see the previous article), which is based on player registrations and massively underestimates the numbers of women and girls who play - because (for various reasons) a lot of women and girls are either not registered, or are registered as boys(!). It also probably doesn't tell you anything that you do not already know (especially if you read this blog regularly), but nonetheless its good to see. So... please let's reward the Independent. Please go to the article and leave a comment. Anything. "Yipee - coverage at last!" would do. Just show them that coverage of women's rugby gets them readers. The final six entries to form the shortlist for the IRB's "Rugby Photo of the Year" contest have been published - and one of the six is a women's rugby photo (see right). This year the competition has a theme - the Spirit of Rugby - so the pictures were selected to show team work, enjoyment, friendship, fair play and so on. The final six include images from professional rugby and grassroots, sevens rugby and 15s. The picture on the right shows the Australian women's team celebrating winning the first women's Sevens World Cup, and an entry illustrating the winning men's team (Wales) is also shortlisted, as is a picture of New Zealand's Tomasi Cama helping up Richard Kingi of Australia to his feet during the Dubai 7s. Away from sevens the judges seem to like pictures of players flying through the air - so we have Adam Jones of the Lions and Seilala Mapusua from London Irish in similar airborne poses. Finally there is a picture from Fiji - and a possible ad here for boots even if it doesn't win the prize - as it shows the only booted player on the field running though the mud and bare-footed opposition. The winner will be announced on November 2nd. The toughest rugby club in the world? Anyone who has read His Dark Materials (the Philip Pullman trilogy) - and at least one former captain is a fan - will know of Svalbard, the frozen Arctic island owned (in our reality) by Norway and mainly populated by polar bears. 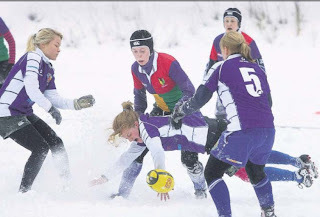 What Philip Pullman may not have mentioned is that - incredibly - the desolate land of snow and ice has a rugby club... and, moreover, a women's team (well, women players anyway). How do we know? Because Rita Sande Rød of Svalbard Rugby has been called up into the Norwegian squad for their Regional Cup game against Finland on Sunday! The first half was a fairly even affair but two brilliant pieces of individual skill from Middlesex gave them a lead of 14-0 at the break. In contrast, the second half was pretty much one way traffic as Letchworth Saracens camped in the Middlesex half for half an hour and pressed incessantly on the try line. The forwards were magnificent all day and drove mauls over the tryline twice but were unable to get the ball down where the referee (or anyone else) could see it. The backs ran and ran, trying all angles of attack and were narrowly denied tries on several occasions before Alice crossed on the left flank to get Letchworth Saracens on the scoresheet. To the final whistle, the girls continued to push but were unable to get the vital scores despite having the ball 'held up' over the line twice and getting to the tryline but unable to make the extra couple of inches on at least 4 occasions. It must be said, of course, that no matter how hard Letchworth Saracens attacked, the Middlesex Leopards defence was awesome and, because of that, they fully deserved the victory. That and the two dazzling tries, of course. Despite the result - and the disappointment that went with it - this was a great team performance with every one of the players giving their all right to the final whistle. Letchworth Saracens U15s convincingly won their Thames Valley league match against Middlesex Leopards at Grasshoppers RFC on Sunday. This was only the second game the girls had played together but they put on a dominating display to score 6 tries and concede only one in reply. This was a great team effort with everyone working together to secure the victory. They really are coming thick and fast - but of all the advances for women's rugby in recent months an announcement today is not only the most unexpected, but also one that could be one of the most significant. The Professional Rugby Players' Association - effectively the trade union for players in the Guinness Premiership - today announced that is will be reorganising itself to become the Rugby Players' Association (RPA), expanding its membership to include players from the Championship (the level below the Premiership)... and also "elite women players" (a term that isn't defined by which presumably includes members of the England squad if not slightly wider)! At the very least this is a huge mark of genuine recognition for the women's rugby - its senior players are now being treated as equals by the top players in the men's game. What is more this recognition is not obviously linked to anything else - there is nothing here that might be cynically linked to some wider campaign (like getting rugby into the Olympics, which might be seen to as explaining the IRB's improved view of the women's game). Women are still - in essence - amateurs - though they benefit from lottery-based training grants that allow them to concentrate virtually full-time on the game they are not under contract to anyone, unlike Championship and Premiership players - so there was no requirement to include them in the new "Union". This is significant because the PRA - now RPA - have been a pretty powerful voice in developing and supporting the interests of its members... and that will include women players. It might, for example, include equal access to training facilities and coaching, funding for international tours, or the inclusion of women's rugby in future TV contract negotiations. But the big thing is that by being a powerful voice in ensuring equality for women players at the top the RPA could have an effect all the way down - for example if the England squad is treated the same as its men's equivalent it will become increasingly difficult for the levels of the game below to treat women's teams differently. It will certainly help insure that the RFU does not allow its attention to drift away from equality now that the Olympic place has been achieved. By 81 votes to 8 it was confirmed today in Copenhagen that Rugby Sevens will be a part of the Olympics in 2016 in Rio de Janeiro, and will also be at the 2020 Olympics as well. Golf also won a place in the games, though the vote for that sport was a little closer (around 63-27 if I recall correctly). The plan is for 12-nation events for both men and women, but this could be enlarged if requested (there were some questions about why only 12 nations would be allowed to compete - the answer was that it was due to the need to keep player numbers down). England, Scotland and Wales will compete as a GB team (the example of the British Lions was give - so we may guess what the shirts will look like!). It was also confirmed that the Republic of Ireland would enter their own team (a slight outstanding question, being as Ireland have historically not been one of the most enthusiastic unions when it comes to sevens), and that the IRFU were "relaxed" about Ireland players choosing to play for GB or Irish Olympic teams. This also means that the next Sevens World Cup (due in 2013) will be that last one, as the IRB also said that they would now work towards the Olympics being the pinnacle of Sevens rugby. Qualification for the 2016 games would presumably start after the 2013 tournament. So... where does this leave things? How does this affect you? First - one certainty. You all can now have an ambition to play at the Olympics. The fact that the games are seven years away means that most of the GB team in 2016 will now be playing junior rugby - and that even if you do not make the Games, the chances are very good that sometime this season you will be tackling (or being tackled by!) someone who will. Next - a bit of speculation. We can expect to see the importance of Sevens rise over the next few years. As things stand it is now an end-of-season bit of fun, with many junior clubs shutting up shop at the end of April and not taking part in May's sevens season at all. That cannot continue. Maybe not this year, but within a couple of seasons or so, I think we can expect to see more sevens tournaments throughout the season, the probable formation of junior sevens squads at national level, and maybe even the addition of sevens to county and regional programmes - in order to identify the special talents that go with the sevens game. And finally - one concern. There is a risk here that 15-a-side rugby could suffer. Funding tends to favour Olympic sports - even in the UK - and if you were a player good enough to play at international level, would you prefer to play 15s rugby in front of a few hundred people at a club ground somewhere in London, or sevens rugby in front of 60,000 (plus live TV coverage) in Rio? Will schools concentrate more on sevens (cheaper, easier to coach, fewer players needed)? This is not a problem that the men's game will face, because the professional 15s game is a big enough balance to the attraction of gold medals and Olympic Games... but is the women's 15s game big enough to compete with such a high profile "rival"? turning right into Macfarlane Lane. Please meet at the Letchworth club by 11.00 am at the latest to travel to Grasshoppers for 12.20 pm. Please let Mike or Wonky know if you need a lift to the match or you are travelling there direct. The U18s, playing in the red and black Saracens shirts, got 'stuck in' from the start and enjoyed a very hard fought game. Sarries took the game to Berks and were denied an early score by very resolute defensive work by the home side who soon showed their attacking prowess to take the lead with a well worked try. Sarries responded with more pressure which led to a quick backs move and a fine try for Sophie on the left wing. With the game swinging end to end it was anybody's guess who would score next and it was Berks who grabbed a try to take a 12-5 lead by the break. Sarries needed a good start to the second half but it was Berks who netted 2 quick tries and took control of the game. Although Sarries continued to press - and were rewarded with a super try by Jess R who surged through to score under the posts - Berkshire Baa-Baas deservedly won the match 29-12. The U15s, playing in black and amber Letchworth shirts, faced a similarly tough challenge in a 7-a-side match. With only a small, inexperienced squad available on the day, this was always going to be difficult for Letchworth Saracens but they stuck to the task valiantly and were unlucky not to get on the scoresheet. The match ultimately went the home side's way by 31-0. This was a great days rugby which both Letchworth Saracens teams thoroughly enjoyed (despite the results!). As these were the first matches they have played as a team, they are also a huge learning experience which will doubtless bring better results in the future. Knowing some of your sartorial tastes I cannot help but think that many of you may be strangely attracted to this new design of rugby sock (see here for details). The only snag seems to be that the smallest size they do is 7. I can't help thinking that the manufacturers (Lovell Rugby) are missing out on a pretty significant market here (being as many adult women have boot sizes smaller than that, never mind teenage players.). If you would fancy a pair but suffer from having titchy feet I suggest you drop them a line and enlighten them! A new initiative to spread the game in the county will be launched next month. 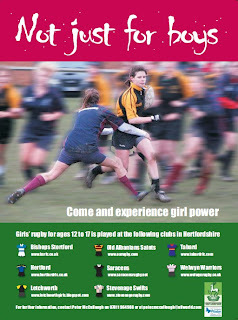 Herts Rugby Awareness Week is aimed to benefit both boys and girls rugby across the county. Permission is being sought for the young speakers to be able to wear their rugby shirt in school that day. Posters (such as the one on the right - click on the picture to see an enlarged version), leaflets and a newsletter are being produced to go out that week too along with hopefully a DVD of Herts Youth Rugby for every school to show during that week. Clubs will shortly be asked to help find players might be interested in speaking in their school assembly so please be ready to volunteer. The aim is to bring new players into the game, as well as encourage more schools to develop girls rugby and enter teams into the schools leagues and into the Emerging Schools competitions.